We love doughnuts here in our home and if we are not making them, we are visiting our local doughnut shop and buying them! We love them plain, with sprinkles, icing, filled with creaming filling and all kinds of different ways! Recently we were sent this recipe to make homemade strawberry doughnuts and wanted to share it with all of you. 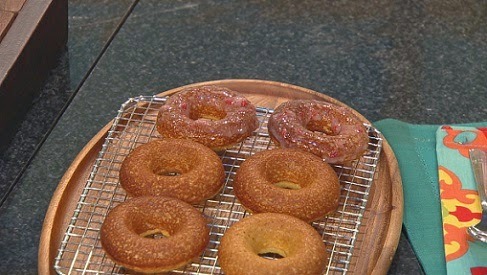 Try this delightful Strawberry Doughnut recipe that was part of a cooking demo on Veria Living TV network’s “The Juice” today! The Juice is a live lifestyle audience talk show squeezing in a fast-paced mix of celebrity guests, pop culture headlines, food, fitness, fashion, beauty, health and more. From meal makeovers to simple secrets to dropping a dress size and looking ten years younger, The Juice is a fun-filled hour that airs on Veria Living TV network at 1pm and 10PM ET giving viewers the tools to transform their lives. 1. Preheat the oven to 350 degree and grease the doughnut with non-stick cooking spray. 2. Using a stand mixer, beat eggs, butter, milk, honey, vinegar and vanilla on medium-high speed until creamy. 3. Add coconut flour, baking soda and salt. Beat on high until smooth. 4. Scoop the batter into a large ziploc bag, seal the top, and snip one of the bottom corners. 5. Pipe the batter into the doughnut mold, filling it completely. 6. Bake for 17 minutes. Remove the doughnuts and cool on a wire rack. 7. When cooled dip doughnuts into strawberry glaze (directions below). Disclosure: The photo and recipe is courtesy of The Juice.